Pressure cookers provide a fast way to cook meals, up to 10 times faster than stove or oven cooking. 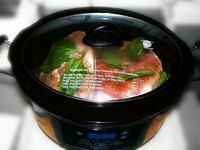 Pressure cookers work by sealing steam within a pressurized, airtight unit. The steam is produced by water or another liquid, such as wine or broth. The steam raises the pressure and temperature inside the pot, which cooks the food. Most foods, including fish, can be cooked inside a pressure cooker. Clean the fish, if necessary, and cut the fish into pieces that will fit into your pressure cooker. Season as desired. Remove the pressure cooker lid. Pour 3/4 cup of water or other liquid, such as wine or broth, into the pressure cooker. Place the fish on the steamer rack on the cooker's support trivet. Pour a thin layer of vegetable or olive oil over the fish in the steamer basket. Close the lid of the pressure cooker. Lock the lid in place so it forms an airtight seal. Place the pressure regulator firmly on the vent pipe, which is located in the center of the lid. Set the pressure level on the cooker's handle to "Low." Not all pressure cookers have a pressure level option. If there is no pressure level, skip this step. Set a bell timer on your microwave or stove for two to three minutes. This will keep you from overcooking your food. Turn the stove burner to a medium temperature. Place the pressure cooker on the burner. When the inside of the cooker reaches pressure, you will notice the pressure regulator jiggling. It should jiggle approximately three to five times per minute. If it is jiggling more often, turn down the temperature on the stove to maintain the desired amount of pressure. Valve-stem cookers have the amount of pressure marked on the valve stem located on the top of the pressure cooker. You want the pressure to be about 15. Allow the fish to cook in the cooker for approximately two to three minutes. Take the pressure cooker off the stove when the cooking is complete. Move the pressure regulator from the lid to allow the steam and pressure to escape. Open the lid once all pressure has escaped from the regulator.